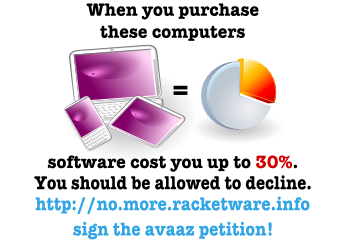 Racketware.info > No More Racketware: avo...oftware you don't want! 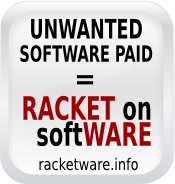 No More Racketware: avoid paying for software you don't want! The goal of our action is to obtain a possibility for the consumer not to pay for pre-installed software during their computing purchase, so as to remedy the current software competition distorsion (AR EN ES FR). You can help. Act now! Most importantly, sign the international petition and tell you friends! (follow our Tweets). 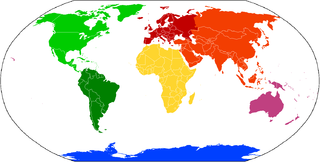 Choose between AR, EN, ES, FR, PT, RCF, other languages. Further ideas for action: EN FR. Within the European Union: easy legal action! Read more: EN FR. 2012/04. Based on European law, French small claims court says imposing the purchase of the operating system is an agressive, hence forbidden, commercial pratice. This decision marks a major step: for the first time, the argument used is very direct. For more detail, see story and legal comment. This makes legal action easy in Europe. 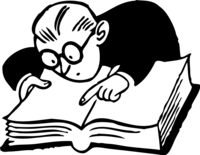 A list of Good Manufacturers that offer software optionality or that provide the software price in avance and refund it easily. and in restoring competition among operating systems. The Globalisation Institute (local copy, with permission): liberal think tank in Brussels calls on ending bundled sales. See also translations (French). Important: sign the international petition and tell your friends!